A classically-trained pianist with over 40 years of playing experience, I hold Licentiate and Associate Diplomas (both with Distinction) in Performance, and teach intermediate (cGrade 4) to advanced students (Grade 8). Through tuition tailored to the individual’s needs, my aim is to encourage students to develop at their own pace to play with confidence, musicality, and expression, and to become independent learners. I offer all students a solid grounding in the technical and stylistic aspects of piano playing, together with an understanding of cultural and historical contexts, and general musicianship. 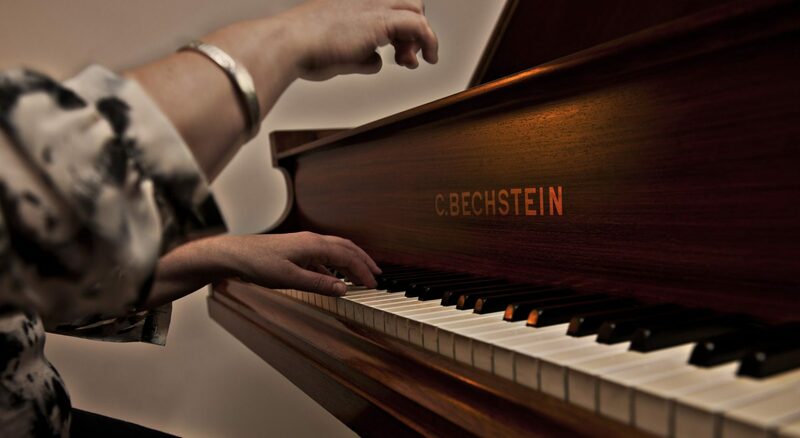 Lessons take place in my home where I have a beautiful 1913 Bechstein grand piano. My students have enjoyed a 100% pass rate in graded music exams, with most achieving a Merit or Distinction. My primary concern is to make lessons as enjoyable as possible, as I feel this stimulates learning, and my teaching style is relaxed and flexible. Students may opt to work towards graded exams, but this is not obligatory. However, I am a firm believer in the premise “practise makes perfect” – and permanent – and I encourage all my pupils to develop good habits and to practise regularly. Full professional member of the Incorporated Society of Musicians (ISM), and an ISM registered private piano teacher. Fully CRB checked (DBS Enhanced Certificate). References available on request. From 2008 to 2014 I studied privately with Penelope Roskell, Professor of Piano and Piano Pedagogy at Trinity-Laban Conservatoire of Music & Dance, achieving Distinctions in Licentiate and Associate level performance diplomas. I now study with acclaimed teacher, pianist and writer Graham Fitch. In addition, I have had coaching and mentoring with Canadian pianist and teacher Alan Fraser and concert pianist James Lisney, and have participated in masterclasses with Murray McLachlan, Stephen Savage and Charlotte Tomlinson. I attend courses and seminars for advanced pianists and regularly engage in continuing professional development to enhance both my teaching and performing skills. In addition to my regular teaching, I also run workshops for adult students on preparing for performance diplomas, performing with confidence and understanding performance anxiety, and am co-founder of the London Piano Meetup Group. I have acted as a syllabus consultant for the London College of Music and contributed teaching notes to the new ABRSM piano syllabus (published June 2018).